three spoons: three spoons have officially opened! 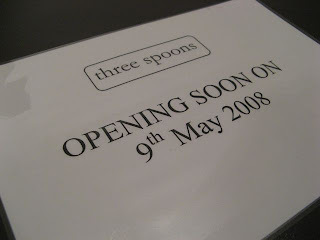 three spoons have officially opened! It has been exactly 3 weeks since three spoons opened the doors and despite the lack of sleep, anxiety, stress, bickering and various unexpected problems we were faced with, it has been a great experience and so much more than we had hoped and anticipated for. The support from the local businesses and our regular customers (yay! we have a few already!) have been wonderful and our friends have been coming in every week filling up the place! So what we've learnt is that there really is no such thing as being OVERPREPARED and the only thing we can really do is expect the unexpected! Tiredness is overtaking us at this hour, so just come visit us and check out the place for yourself!